Rc. No.110/R&T/Rect.2/2018, Date: 25-01-2019, APSLPRB has issued the AP Police Driver Operator Posts 2019 Recruitment notification on January 25 and Applications are invited from the eligible candidates for recruitment to the post of Driver Operator in Andhra Pradesh State Disaster Response & Fire Services Department. 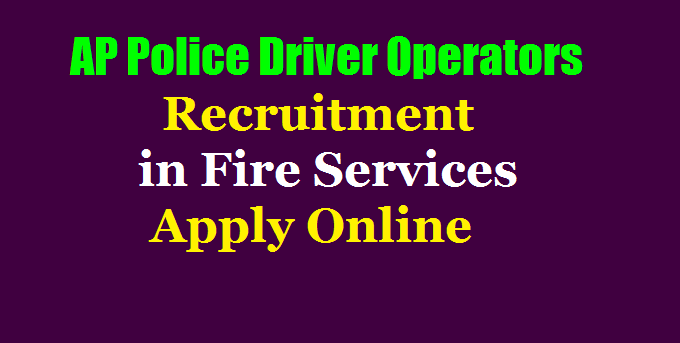 Applications are invited from the eligible candidates for recruitment to the post from 29th January2019 to 06th February 2019 of Driver Operator in Andhra Pradesh State Disaster Response & Fire Services Department. The number of vacancies indicated below is only provisional and is liable to alteration. State Level Police Recruitment Board(APSLPRB), Andhra Pradesh (AP) has released Notification for the post of 85 Driver Operator in Andhra Pradesh State Disaster Response & Fire Services Department. Applications are invited from the eligible candidates. Candidates can apply through online from from 29-01-2019 to 06-02-2019. (i) The candidate, as on 1st July, 2018, must have passed SSC or any other examination recognised by the State Government as being equivalent to SSC. (ii) Must possess current and clean Heavy Motor Vehicle License which must have been valid for a minimum period of two years as on the date of Notification. For All Other Candidates: Candidates must have attained the age of 18 years and must not have attained the age of 30 years as on 1st July,2018. The upper age limit prescribed in above will be relaxable as upto a maximum of five years if a candidate belongs to a Backward Class or a Scheduled Caste or a Scheduled Tribe. a) Height: Must not be less than 164 cms. b) Chest: Must not be less than 83.80 cms round the chest on full inspiration with a minimum expansion of 5 cms. iii) Each eye must have a full field of vision. iv) Colour blindness, squint or any morbid condition of the eye or lids of either eye shall be deemed to be a disqualification. NOTE : In order to prevent disappointment, candidates are advised to have themselves examined by a Civil Surgeon before applying for the examination to ensure that they meet the prescribed Physical and Medical Standard. 1. Selection through Physical Measurements and Driving Tests. 3. When two or more candidates in a particular category obtain equal marks, preference will be given to the candidate who was born earlier. Candidates must apply in the Application Form which can be purchased from the Office of the Superintendent of Police of the concerned District against cash payment of Rs. 10/- (Rupees ten only) between 10.30 A.M. to 5.00 P.M. from 29-01-2019 to 06-02-2019 on all working days. Eligible candidates should submit the application form (duly filled in) along with the copies of the necessary certificates at the Office of the Superintendent of Police of the concerned District from 29-01-2019 to 07-02-2019 on any working day in between 10.30 A.M. to 5.00 P.M. Application Fee: A prescribed fee of Rs. 25/- (Rupees Twenty Five only) in cash should be remitted at the time of submission of each application form. Demand Drafts, Cheques, Indian Postal Order etc., will not be accepted. SC/ST candidates are exempted from paying this fee.